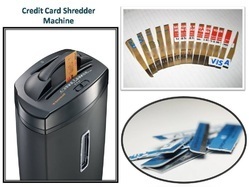 Prominent & Leading Manufacturer from Mumbai, we offer industrial credit card shredder and credit card shredder. A commercial machine for companies that manufacture and process credit cards, When you have a large quantity of plastic cards this is THE machine for you, get it shredded in very small pieces without losings its scrap value. Machines available in small, medium , large and extra large capacities. No matter how much you have for shredding we have the right machine for you! BIG - For Banking Sector Etc. These machines can even shred CD's, floppy disks, Pen drives and such small items along with papers. Data on hard copies should be destroyed at any cost and requires that organizations shred confidential documents and other optical devices which contain sensitive information like bank details. 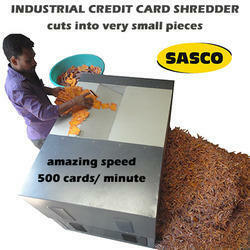 We at SASCO provide these type of shredders for home and office use and also for heavy commercial applications. Contact us to know more about the models and best prices.